Priyani de Silva war Kinderärztin in Sri Lanka. Im Interview mit uns erzählt sie uns von ihrem Studium, ihrer Tätigkeit als Ärztin und dem Alltag, den sie bewältigen musste. Tell us something about you. 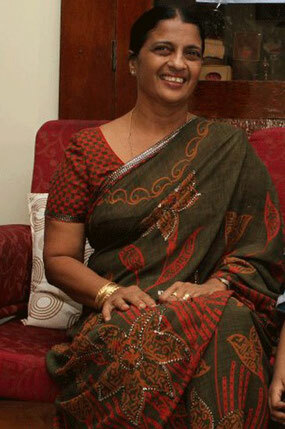 My name is Dr. Priyani de Silva, I'm 61 years old, married for 32 years and got two children. My daughter - now 31 years old - is working as a sales director. My son - 29 years old - is studying Economics in Scotland. I live in Sri Lanka and worked for the Lady Ridgeway Children's Hospital as a M.O. (Medical Officer) for the O.P.D. (Out Patient Department = Notaufnahme). Now im retired since September 2015. Why did you decide to become a doctor? I wanted to do something for the less privilege sick people in my country. Therefore I joined the government hospital. Where did you study medicine? What was studying medicine like? I studied at the faculty of medicine, University of Sri Lanka, in Colombo. The studies were hard, but an average student can handle it. It is important to study your books and to visit the hospital regularly to see your patients. In Sri Lanka the studies take five years. First you do your M.B.B.S. (Bachelor of Medicine, Bachelor of Surgery). Then you do postgraduate studies according to your choice. I did my diploma in Family Medicine which took another two years. That means you had your own patients you had to take care of during your studies? Yes, we were given a few beds and were supposed to know everything about those patients. In the morning all students had to follow our consultant. We visited each patient and the student who was responsible for him was asked questions infront of the others. He had to answer everything without looking at any notes. How is an average day at work? As I worked in the O.P.D. I had fixed hours to work on a 6 hour shift basis: 7 am to 1 pm, 1 pm to 7 pm or 7 pm to 7 am. You get the following day off if you do the night shift. How many hours do you work in a week? Every other sunday and every other public holiday we get a day off. So in the first week we work 7 days, 6 hours each. In the second week we work 6 days, 6 hours each. What is the reputation of a doctor in Sri Lanka? People respect the doctors in Sri Lanka and have high regards for them. Are there alternatives to a doctor? Can people go to somebody else to get help? Yes, we have apothecaries. They are also allowed to give medicine. It needs to take a 3 years training course to become apothecary. What are common patients in Sri Lanka? Heart attack and lung cancer are among the most common death causes in Sri Lanka. However more people die on the road than of sickness. My patients are all under 12 years old. Most of them come with cough, cold and fever. What is the healthcare system in Sri Lanka like? Do people need to pay for their treatments? Do they have an insurance? There are a few people who have an insurance. They can go to private hospitals. In hospitals of our government however everything is free of charge. So even for poor people it is no problem to get surgery or all investigations including MRI scan etc. That means we have a 100% healthcare system. So far, no patient is turned down. I like my job very much, I enjoyed working with my patients. Getting the correct diagnosis is a challenge. However more than anything I like to see a patient who is cured and happy after the treatment. That's the best feeling a doctor can get. It is marvelous. Dr. de Silva, thank you for your time. DPS Medical: Innovative Lehre für Mediziner. Helft uns und teilt unsere Seite! Schon gewusst? Wir unterstützen die Deutsche Kinderkrebsstiftung.